So as some of you know, I am spending the first four days of this week at level 2 training for Math Recovery. For those of you who are unfamiliar with Math Recovery, I would HIGHLY HIGHLY recommend it. If you are unfamiliar with it, CLICK HERE to get a little more information. I don’t work for them or get anything for this post–I just feel very strongly about what they are doing and believe strongly in the philosophy that is promoted by the Math Recovery people. I thought I’d write a few different blog posts over the next weeks to highlight some of the pieces of learning/insight I gleaned from the workshop, but I can’t lie–there is no replacement for 8 days of training (4 for each level), and if you can find someone who will pay for you to go, PLEASE jump at the chance. So…to get started, I thought I’d dig into a few little “starred” items in my notes! Remember…this is the second 4 of 8 days, so a LOT has happened. I thought I’d just give you a few “takeaways” to see if they might be relevant to your instruction! 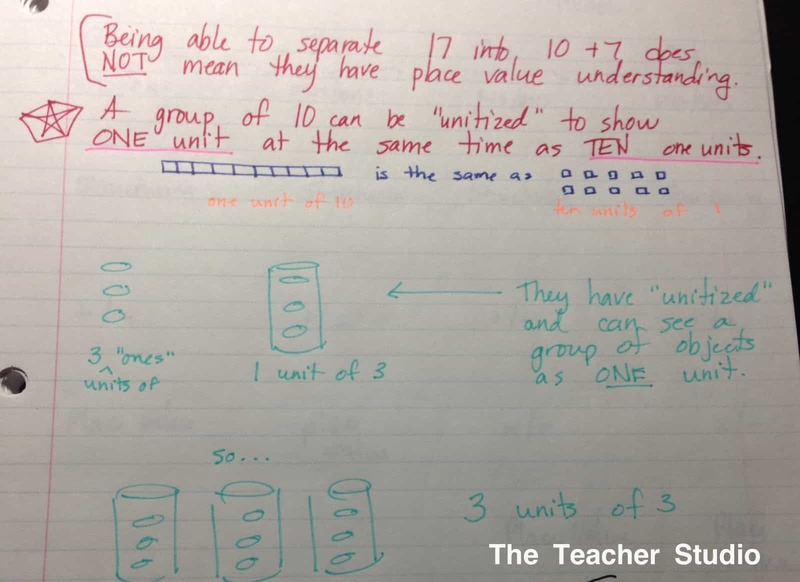 To really understand “number”, students need to be able to comprehend that a number can actually mean two things at one time–that a “ten” can be a “unit” (one ten) and–at the same time–can be 10 of a different unit. Know what I mean? Three candies (see the turquoise sketch) can stand for 3 candies OR it can be one GROUP of three candies, forming the foundation of multiplication. The mathematical term is “unitize”…the ability to see that a group of items can also be one unit. Without this, do you see why addition and subtraction are so difficult? How they just “cross out the 0 and make it a 9” and other such procedures. I wish I could explain this as articulately as our presenter did…but she made it so clear that many of our students who we ASSUME have this understanding truly do not and it leads to problems down the road in addition, subtraction, multiplication, division, and BEYOND. UGH! I keep rereading and noticing that I just can’t convey this well. I almost deleted it…but maybe SOMEONE out there will see what I mean and can chime in. Students need to be able to flexibly move between different types of groups. Here’s another example. How many 10’s are in 532? What will your students answer? 3? But no…there aren’t. This is a “3” in the TENS place–but there are 53 tens in that number. 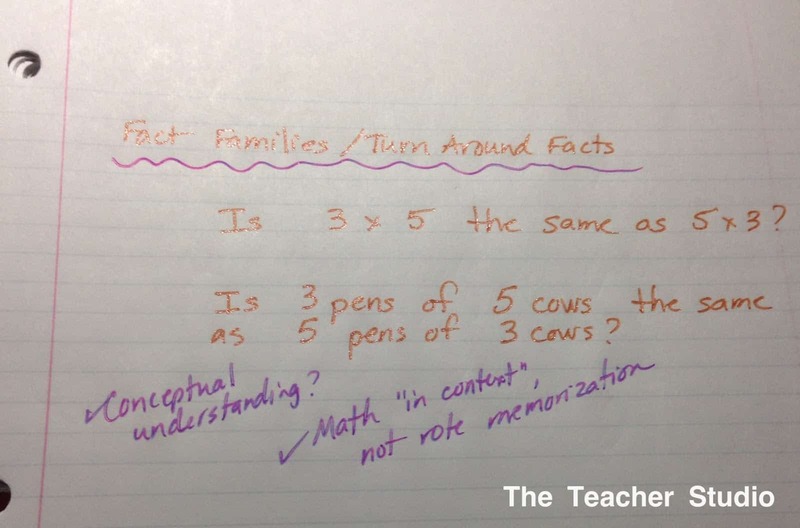 Next, I am sure that many/most/all of you teach the concept of “turn around” facts or fact families. So I want you to reflect for a minute on how you teach this concept and what wording you use. Yes, both involve 15 cows in all…but do you see how the situation is completely different? We need to be very careful about presenting “naked numbers”–numbers without stories–while students are developing their understanding. How many times do students see two numbers in a problem and instantly add them or instantly multiply? We need them to THINK when they get to problems. Do you TELL them the “turn around” fact “rule” (“commutative property of multiplication”) or do you wait for students to discover it? Do we want students deriving or “constructing” their own meaning or are we the ones who should be imparting this knowledge to them? What kinds of learning experiences can we design that will help them come to this conclusion on their own?